Meanwhile, Microsoft - who never garnered much interest for the Tablet PC platform - has announced that Windows 8 will run on computers and on a new breed of Windows 8 tablets. Details are sketchy, however. Here are 8 must-have Windows tablet features we want to see at launch. If Windows tablets do not provide real multi-tasking, and instead work more like a Windows Phone, the platform will start off slowly. On the PlayBook, you can run a game in the background and it will continue to run. You can even upload files to Dropbox and switch over to your e-mail and send attachments. On a Win 8 tablet, multitasking would be a major differentiator. Microsoft has experimented with cloud email since the original Hotmail, yet they've kept the basic Outlook client in tact. (Exchange Online is a step in the right direction, though.) On a tablet, Outlook should become a full cloud-based client like Gmail. On your computer, a Windows Phone 7 device, or Windows tablet all email should be a click away. Not all Android tablets offer a video store - the Motorola Zoom and HTC Flyer do, but not many others. Microsoft will likely port Zune software to tablets, offering video downloads as they do now on a Windows Phone. To compete with Netflix, Microsoft should also offer a monthly plan to stream at least a few major Hollywood releases and not just for-rent downloads. Windows 7 hinted at some innovative touch features - on a touchscreen laptop, you could spin a globe, rotate photos, and play a few touch-enabled games. Windows 8 needs to go beyond what Apple offers with the iPad and include quick gestures for deleting emails, photo rotation, and a new way to control games. The challenge is to make the most powerful apps, say for project management or video editing, work with gestures, zooming, and swipes. The HP TouchPad enables you to group documents together even if they are from different apps. On a Windows tablet, we want a feature for grouping documents from Excel and Word, add related emails, and even Internet Explorer pages using the tile interface. This grouping would help organize projects in the same way you'd group files on a computer. A way to then e-mail all grouped docs would be a bonus. The Apple iPad lets you view and edit Office documents, but not with full desktop-like applications. Windows 8 tablets provide the Office suite for editing rich documents, making pivot tables in Excel and adding charts, and making PowerPoint slide sin a way that competes with Keynote (templates, slide-sharing). And, each app needs to print over Wi-Fi. Here's a unique feature that could set Windows tablets apart. 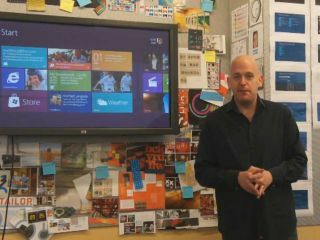 Microsoft should take what they have learned with the Surface Table and move it to the small screen. This should include two-player chess and checkers, shared photos that multiple people can stretch and rotate, and a full-screen browser that works faster than Google Chrome on a desktop machine. We want to see a version of Halo running on Windows 8 tablets at launch, plus other Xbox 360 games like Gears of War. Too much to ask? If Microsoft really wants to dethrone Apple, it should start by making the Windows 8 tablet the go-to platform for games, include achievements and link into the console version of the game -- maybe even as an extra controller.